Find out more about my Great British Bake Off challenge. So, the latest episode of the wonderful Bake Off included a technical tuile challenge, signature traybakes and showstopping biscuit towers. Now, tuiles are lovely and all that, but they probably aren’t the most pleasurable type of biscuit to eat, and they do look like a bit of a faff to make. I love biscuits, but a tower of them … even made into a Dalek … is not entirely practical. So I decided my best bet was to make a traybake. 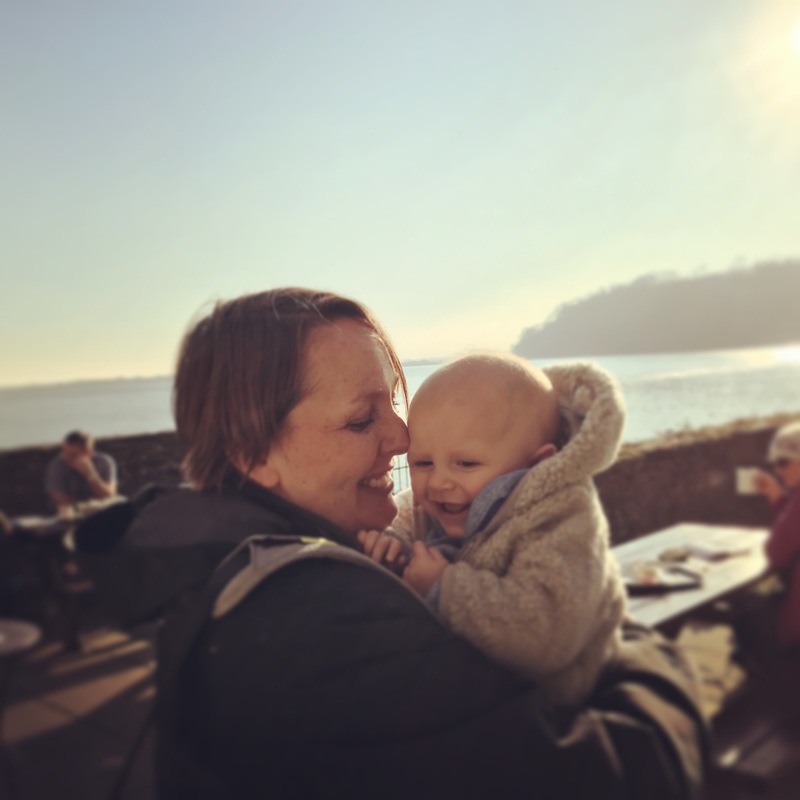 And as I was going for a day out with the girls at the weekend, a traybake would be a portable gift to palm off on them so I wouldn’t be ‘forced’ to eat an entire one on my own! But what to make? I had made blondies for a recent elevenses – they were lovely but the chocolate chips had all sunk to the bottom which was annoying. I regularly make Nigella’s Domestic Goddess brownies (best I have ever eaten) but I can whip a batch up with my eyes closed so they aren’t terribly challenging and my GBBO challenge is all about trying new things and improving my baking skills. Then I looked at the little packet of salted caramels I had treated myself to in Paris (from the Grand Epicerie – oh my word, what a place!) and decided that salted caramel millionaire’s shortbread would be a perfect traybake to make (even though the actual baking element is minimal). 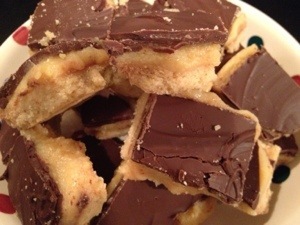 Even better, millionaire’s shortbread actually has very few ingredients, and if you are a keen cook it’s likely they’ll already be in your kitchen. They were in mine, so I gathered everything together and got started, broadly speaking following Nigella’s Domestic Goddess recipe. I have happy memories of making (non salty) millionaire’s shortbread once before for our lovely friends Bree and Noah’s wedding. They were getting married in Whitstable and I spent the days before making a variety of goodies for their wedding ‘picnic’ spread as their gift. It was my first real experience of mass catering and I loved it, especially because Bree was pleased with everything I made. The whole wedding was one which various friends and family were involved by contributing in some way (time, effort and / or their skills), and it remains one of the best weddings I have ever been to – full of love and fun, and those words reflect their life together many years later. But back to the recipe. Firstly the shortbread – flour, butter and sugar combined together to make a beautiful dough which bakes into a perfectly buttery, crunchy, crumbly biscuit. Then topped with a rich caramel made from condensed milk, butter and golden syrup, plus a sprinkling of sea salt. Finally slathered in melted chocolate and chilled until the chocolate is crisp. Beautiful. I did forget to put the salt into the caramel as it was such a nightmare to make … Nigella said you just melt the butter and mix it with the condensed milk and syrup and then microwave the mixture, checking and stirring every minute until the sauce thickens and turns golden brown. Well, even in one minute the mixture can boil over and as you can imagine, the spilt mixture is an absolute pain in the neck to get off of the microwave plate. It also is hot and sticky and burns if you touch it, and I think it would have been easier to heat the mixture in a saucepan like traditional recipes dictate. I don’t ever want to have to clean that mess up again. As it happened I eventually sprinkled the sea salt on top of the caramel before I added the chocolate topping, and it seemed to work well. I also burnt the first lot of chocolate when I melted it in the microwave as Nigella suggested. It was too burnt to use but not burnt enough that I couldn’t eat it off the spoon while I scraped (some of) it into the bin. I felt quite ill by the end of it all. Cutting up the traybake into little squares was less than beautiful – the chocolate cracked and the caramel filling squished out of the sides. I am not sure how you can actually do this easily – if you do know then tell me, because I don’t think Paul and Mary would have been too impressed with what I ended up with. However, the girls were pleased with their little goodie bags of millionaire’s shortbread, and I was pleased with the bits I ate. 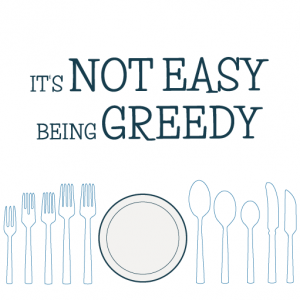 I wouldn’t want too much of it hanging around the house, as it’s not only dangerously addictive but also terribly fattening, and as I am a little piggy I can eat quite a lot of it! 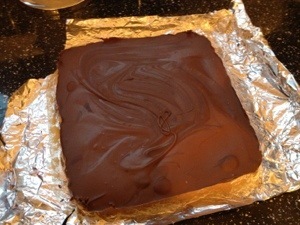 I used a square tin of approx 10cm x 10cm which I lined with foil (so that I could lift out the traybake easily). Preheat your oven to 170 degrees and rub 175g of the butter into the flour and sugar until it resembles breadcrumbs. 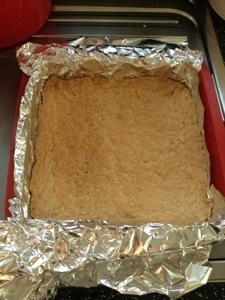 Then squish the mixture together until it clumps into a ball and press it evenly into the bottom of the baking tin. Prick the mixture with a fork and put it in the oven for 5 minutes before turning the oven down to 150 degrees and baking the shortbread for another 30 minutes until it’s golden brown. 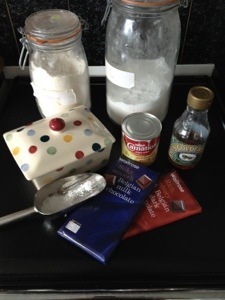 Allow to cool completely before topping with the caramel, which you make by mixing together the remaining 200g butter (melted) with the can of condensed milk, the salt and the golden syrup. Nigella says you can do this in a microwave but next time I’ll do it in a saucepan on the hob, stirring constantly. The mixture is ready when the caramel thickens and turns a light golden brown. Pour it straight over the shortbread and once again allow to cool (if you forget the salt, sprinkle it on top of the caramel at this point!). 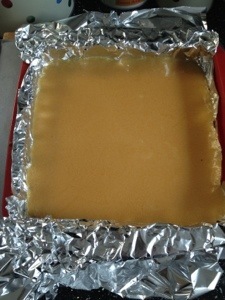 Melt the chocolate and pour the mixture on top of the caramel and then chill it in the fridge until you are ready to cut it into squares and serve it. I have no idea how you cut nice squares without the caramel squishing out, but it tastes so good that probably no one will care. Try not to eat it all in one go. Apparently it lasts in the fridge for a couple of weeks so you really don’t need to. 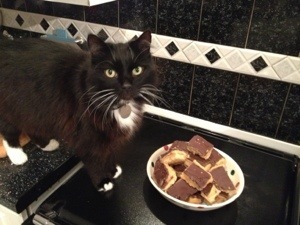 Thanks Suzanne – so was your rocky road, which I ate ALL of last night – whoops! The millionaires shortbread was yummy. I didn’t think I’d like it but I did. Scoffed it and said yum! It was well worth travelling to London to be part of your bake off challenge. Try cutting the squares with a hot knife soaked in water. Good idea – I will definitely give that a try, although if it doesn’t break into a few little messy pieces, what will I nibble on whilst cutting them up? !